When luxury and style is a must, visitors look to Ambassador Hotel in Wichita to bring it. It’s the only Kansas hotel with a AAA Four-Diamond rating and was recently named the best hotel in Kansas by U.S. News & World Report. Ambassador Hotel offers a trendy speakeasy experience of the 1920s. Dockum, tucked in the basement of the Ambassador Hotel, provides an intimate bar atmosphere with a décor reminiscent of the historical drugstore that was housed in the Union National Bank building for decades. Located near a historical landmark like the Keeper of the Plains your hotel is just steps away from all things Wichita. Within walking distance of several shops and boutiques, take a moment to stop by Old Mill Tasty Shop at 604 E. Douglas for an afternoon snack before exploring what downtown Wichita’s shopping strip has to offer. Pay attention to the newly-added urban spaces like the ICT Pop-Up Park and the artwork and sculptures scattered about the city’s streets. Downtown is also home to many art galleries, showcasing the work of local artists, giving a Bohemian feel to the modern city. For dinner, take the Q-Line trolley down Douglas to Larkspur Bistro & Bar for a fine dining experience. Enjoy a glass of wine on the patio as the sounds of a Baby Grand Piano calmly dance through the evening air. Larkspur Bistro & Bar offers a unique blend of Mediterranean, French, Italian and American dishes, accompanied with artistic appetizers. Be sure to leave room for one of the delectable desserts. After dinner, brush up on your painting skills or learn a new trade at Pinot’s Palette located 338 N. Mead. Grab a glass of wine and prepare to paint as local artists lead the step-by-step party. At the end of the night, you’ll be able to take home your creation and all the memories you made along with it. 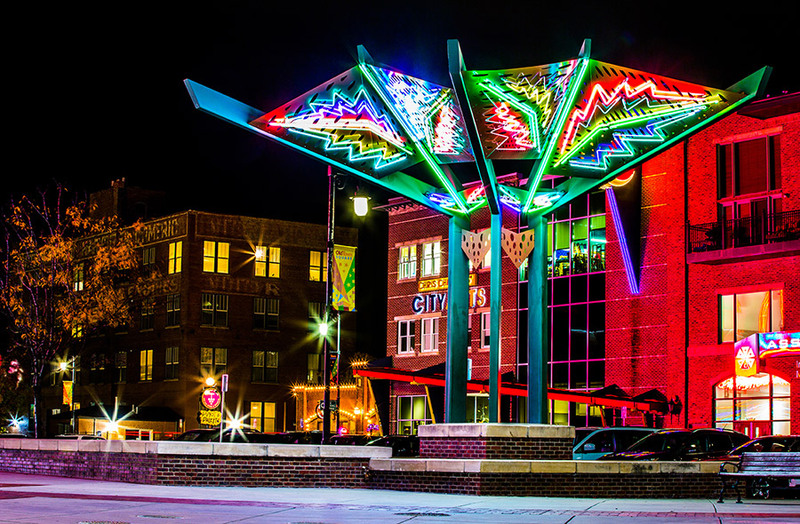 Wichita’s nightlife comes alive as the city awakens to an active bar and club scene. From live music to comedy shows, there’s an avenue of entertainment for everyone. You can head to The Loony Bin Comedy Club at 215 N. St. Francis to roar in laughter with a variety of stand-up comedians. For a more reserved atmosphere, head to Delano District’s Monarch for an evening drink or late-night meal. For breakfast, take in some artisan donuts at The Donut Whole at 1720 E. Douglas. With more than 40 donut flavors made from Kansas-grown ingredients, you have the opportunity to try many quirky creations like the King Midas (vanilla, salted peanuts and Lyle’s Golden Syrup) or the Sunshine Citrus Crunch (topped with citrus glaze and fruity cereal). Every week, the donut shop also creates specialty flavors, including items like Red Velvet, Pumpkin Spice and Tiramisu. A short trip west of Wichita will lead you on a walk with wildlife at Tanganyika Wildlife Park in Goddard. Take part in a once-in-a-lifetime experience of hand-feeding a ring-tailed lemur or Indian rhino. You can also stand face-to-face with a giraffe while feeding it carrots or hold a cup of nectar as colorful lories drink. In case of bad weather, always have a back-up plan. Load up on snacks at The Spice Merchant at 1300 E. Douglas. From delicious, caramelized banana chips to spiced nuts, this hidden gem offers sweet treats and access to dozens of coffee and tea blends. Try some in the store and take some home with you. If you are looking to take part in a piece of a history, Wichita offers an array of museums in the downtown area. At the Museum of World Treasures, you meet Ivan the T. Rex, one of the most complete T. Rex skeletons in the world. Explore other museums here. Bradley Fair is one of Wichita’s eight shopping districts, so take time to enjoy nearly 50 stores or slip into Healing Waters, Pure Salon and Spa, or Bohemia Healing Spa for a relaxing treatment. For lunch, head to Bella Luna Cafe to try their famous hummus dips, or get fresh seafood flown in daily at Newport Canyon Grill. Be sure you save room for dessert at Cocoa Dolce Artisan Chocolates, the only place in Kansas you can buy Marañon Chocolate, made from chocolate declared pure by the USDA. Don’t forget to try the Samuel Smith’s Organic Chocolate Stout beer! Many people don’t know Wichita is home to some of the best golf courses in the country. With five public courses, golfers can choose from a variety of layouts for all skill levels. L.W. Clapp Golf Course is the shortest of the courses, but its challenging holes will test the short game of even the most skilled players. Also at L.W. Clapp, patrons can play FootGolf at the first course in Kansas. As disc golf becomes a popular outdoor activity for many, you’ll be happy to know Oak Park in Riverside and Herman Hill Park in south Wichita both have challenging courses for any skill level. River City Brewing Co. offers the largest outdoor patio, live entertainment, six microbrews and 16 beers on tap if you are looking to unwind after a long day of exploring. Grab a unique pizza topped with beer cheese, bacon and BBQ sauce or try one of the brewery’s signature macaroni and cheese plates. When River City Brewing Co. opened its doors in 1993 in one of Old Town’s historic buildings, it was the first brewpub in Wichita and only the third brewery to open in Kansas in well over half a century. For more than 20 years now, the establishment has been serving handcrafted ales and a food menu reflecting Kansas&apos; beef heritage. Wichita is home to seven local breweries, the majority within walking distance of each other in downtown Wichita. Explore our favorites here. Remember to drink responsibly and take advantage of the Q-Line trolley. After dinner, you can head over to Century II for a Music Theatre Wichita production. A little piece of Broadway nestled in Wichita; Music Theatre Wichita’s professional performances bring works like “Hairspray” and “Disney’s Newsies.” Treat yourself to a spectacular play during the company’s 46th season and revel in knowing many of Broadway’s finest stars got their start right here in Wichita. When the curtain closes, Old Town’s nightlife awakens once more. 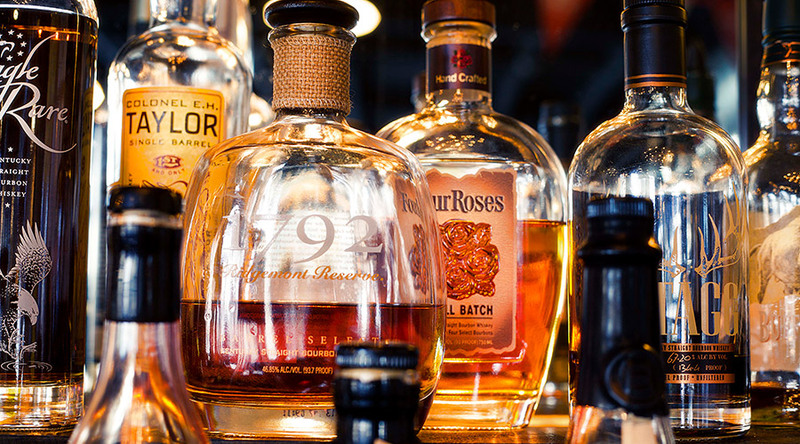 Head back to your hotel for a rare experience at a real speakeasy. The Dockum is located in the basement of the Ambassador Hotel and prides itself in exclusivity and discretion. Only six to 18 people are allowed in at once, but it is truly an experience worth waiting for. If you’re looking for something a little more up-beat with live entertainment, head to Barleycorn’s at 608 E. Douglas for local performing acts. As you pack up to head out after your weekend in Wichita, be sure to stop by Doo-Dah Diner at 206 E. Kellogg for gourmet or home-style comfort food. “Doo-Dah” is the city’s nickname, probably referring to the laid-back, whimsical attitude felt by some visitors to the city. If you have some extra time, head to Botanica Wichita at 701 N. Amidon to take a quiet walk through the gardens. With more than 30 themed gardens, Botanica Wichita is celebrating its 30th Anniversary. Take a cultural journey through the Chinese Garden of Friendship and learn about Wichita’s sister-city, Kaifeng. Finish up in the Shakespeare Garden or take a Woodland Walk. We hope you enjoyed your stay in Wichita no matter what fun activities you found to do. Just remember to make every moment count! Tailor your vacation here by looking at a calendar of events happening in the city during your stay.